Today Mr A is at home with fevers and sniffles. So much for a good week to concentrate on work. There has been so much flu about this year, including the dreaded swine flu, but this time I think it is just his 6 year old molars cutting through. So, as planned I still made a quick trip to Wooloongabba's Antique Centre today and dragged him along. We ended up buying a 2nd hand jigsaw puzzle which will no doubt fill my coffee table for the next few weeks. Amongst other things disastrous and disappointing, (yes that is how I feel when my day in the studio is postponed...again) I accidentally washed Miss M's woolen dress in the washing machine. So now I have a very, out of shape, felted and shruken mess. What to do? What to do? It is no good to pass on to anyone, so should I use it for some sewing project? Maybe for my matryoshka's somehow. It is really springish here, yesterday even summer like. I ventured into my garden and it really needs some TLC. I even have this 'thing' growing in my pool area. There are plenty of cobwebs and leaves that need fixing. On a brighter note, a dear friend of mine has launched her self into the world of Etsy and is using her wonderful sewing skills to make handbags and more. Go and have a little peek. I'm stuck as to what to write here. This is my third attempt. I just have too much to think about and promises to myself that still need completing. I've been taking plenty of photos of wool for a client. Bags full of yarn in all different colours and shapes are sitting here looking at me...oh it is like bags full of lollies or sweets sitting around waiting to be eaten. Except I have to give them back in perfect condition. It's torture I tell you. But I am having fun. 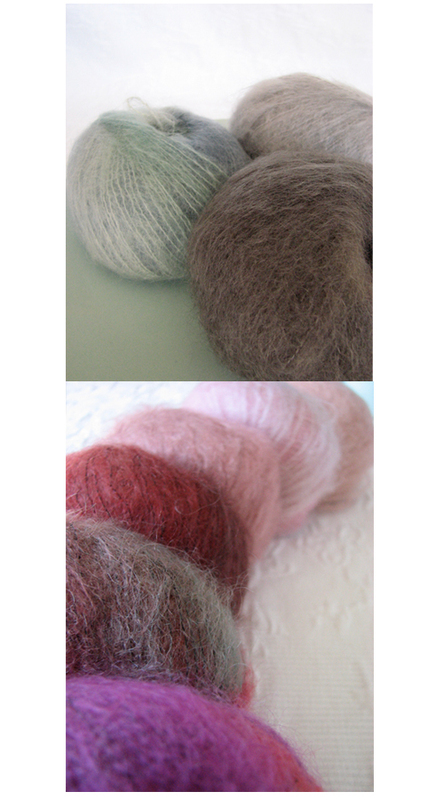 Oh, and to satisfy all you woolly freaks out there, these balls are from the Rich More range. Mohair, Count 5.